Pistols designed for concealed carry are usually exercises in compromise. Barrels and grips are shortened for concealability, but that results in a shorter sight radius, which makes it harder to aim. That approach also produces a lighter gun with less gripping surface, which results in increased recoil and reduced capacity. That said, the gun you have on you is better than the one you don't, and compact versions of the 1911 have been around for decades because while Ol' Slabsides is flat, it isn't small. Gunsmiths began hacking steel off the slide and frame in an attempt to make the pistol more concealable. Seeing how popular and useful the smaller 1911s were, Colt began doing the same with regular factory offerings. It first offered the Colt Commander, which cut 0.75 inch off the Government Model's five-inch barrel. Next came the Colt Officer's Model, which cut the barrel down to 3.5 inches, shortened the frame approximately 0.75 inch and reduced capacity in .45 ACP by one. Nowadays, the "Commander" and "Officer's" lengths have become standardized terms. The shorter grip of the now-discontinued Officer's Model concealed better while being long enough for most users to get all their fingers on it, but the Officer's Model had a reputation for being finicky. A famous gunsmith once told me he could not consistently get 1911s with barrels shorter than four inches to be reliable. When it comes to concealed carry and 1911s, the "Goldilocks gun" seems to be a combination of an Officer's-length frame and a Commander-length slide. Small enough to conceal, it is big enough to be considered a real gun and enable the user to hit what he or she is aiming at. The only drawback to the smaller frame is the reduced capacity—generally seven rounds in .45 ACP. Enter the Stinger. Les Baer should need no introduction to readers of Handguns, but for those of you new to guns in general or 1911s in particular, Les and his team of talented gunsmiths have been turning out custom 1911s for decades. Les Baer has offered a Stinger as a catalog item for a while. This pistol combines his Commanche-length slide and 4.25-inch barrel with a compact frame. Originally offered in .45 ACP, the Stinger is now offered in .38 Super. This, I think, was a brilliant decision, as now you can have an 8+1 capacity concealable pistol, chambered in a cartridge that basically amounts to a 9mm on steroids. Unless you have massive meat paws you'll be able to get all your fingers on the shortened frame of the Stinger, which is approximately the same length as that of a Colt Officer's Model. To ensure they stay there, the frontstrap is checkered 30 lpi and cut high under the trigger guard to give you more control. The Stinger also has a beavertail grip safety with a hump at the base to ensure people such as myself with small hands can still deactivate the safety even when using a proper thumb-high hold on the gun—a hold that tends to pull your hand off the back of the frame. The mainspring housing is steel and vertically serrated. The Stinger has an extended ambidextrous thumb safety and checkered cocobolo grips. The magazine well in the frame has been slightly beveled. If you choose to bolt on an aftermarket magazine well, just be aware you're adding bulk to the pistol in the one spot most likely to print underneath your clothes. Designed as a concealed-carry pistol, every sharp edge on the Stinger has been removed, and it features night sights with tritium inserts provided by Trijicon. The front sight is a serrated ramp dovetailed into the slide. The rear is a no-snag model that's also in a dovetail, so it is adjustable for windage. I would have preferred front cocking serrations as well because I use them, but many people don't, and pistols with no front serrations do look "cleaner." This pistol has a ramped barrel and supported chamber, and a stainless steel barrel bushing. If you've ever picked up a Les Baer pistol you know they are tight and have a deserved reputation for accuracy, and the Stinger was no different. You'll need the polymer barrel bushing wrench supplied with the pistol to take it apart. It has a standard GI-type recoil spring guide rod. To help users hit what they're aiming at, the Stinger is advertised as having a four-pound trigger pull, which is exactly what the pull on my unfired specimen measured. Knowing how trigger parts on 1911 tend to settle in, after a few thousand cycles you can expect the trigger pull will drop to about 3.75 pounds, which is perfect for a carry gun. I know—many gun gurus talk about how trigger pulls lighter than dragging an anvil through gravel will expose you to additional liability if you have to shoot someone. As a former police officer I don't understand their thinking. If you get into a shooting, either you hit what you were aiming at or you didn't. If you did, then trigger pull weight isn't an issue. If you hit something or someone other than what you intended, all bets are off anyway. Better to have a gun with a good trigger that allows you to hit what you're aiming at, and quickly. If you're of the opinion that any cartridge that doesn't start with the number "4" is not suitable for self-defense, you've probably already stopped reading. The fact is that bullet placement on the target is much more important than caliber, provided you're using something more powerful than a .32 ACP. The .38 Super cartridge has been around since 1929 (I had to look that up, and even I was surprised it's been that long) and most often chambered in 1911s, but it has never been as popular in this country as the .45 ACP cartridge. It was much more popular in Mexico due to laws restricting the use of military or police calibers by civilians. As the original base cartridge for the Super was the noticeably weaker .38 ACP, in the 1970s the industry began calling the Super the .38 Super +P to differentiate it. What's the .38 Super? Ballistically, it is a 9mm +P+ and maybe a little bit more. It doesn't quite equal the muscle of a .357 Magnum, but it's close. When it was introduced, the .38 Super was advertised to police agencies as being able to penetrate body armor and car doors. While it did do that better than the .45 ACP, many agencies were loath to give up their revolvers for semi-autos. When the .357 Magnum was introduced in 1935, cops could have the performance of the Super in a revolver, so the .38 Super never really caught on commercially, except among competition shooters. The .38 Super features a semi-rimmed case. There is not much of a rim—you can feel it with your fingertips more than you can see it—but it still is not as inherently reliable when feeding from magazines, especially double-stack magazines, as rimless cases. These days, however, with a quality firearm and magazines, this isn't an issue. Why not just chamber a 1911 in 9mm since it is a more common cartridge and +P ammunition is widespread? Many gun makers have, but the 1911 is designed to run best around cartridges the length of a .45 ACP, and getting even a custom 1911 chambered in the much shorter 9mm to run well is problematic. The .38 Super is the same overall length as the .45 ACP. While not as common as some calibers, a number of ammunition manufacturers offer both full-metal-jacket and hollowpoint loads for the .38 Super. In fact, that was the source of the only complaint I had with the Stinger: the ammunition. I know people who have regularly handloaded their competition .38 Super ammunition to push 125-grain bullets faster than 1,400 fps. While I know no factory is going to push the cartridge that hard, it is called the .38 Super +P, so I'm surprised offerings are so anemic. Federal was kind enough to send me both the American Eagle full-metal-jacket and jacketed hollowpoint offerings. The 115-grain jacketed hollowpoint America Eagle load, which claims 1,130 fps, produced an average velocity of only 1,118 fps out of the Stinger. That doesn't even qualify as a 9mm +P, and between the tight gun and the stiff recoil spring, the American Eagle 115s barely cycled the Stinger's slide. Federal's 130-grain full-metal-jacket load was a little better, averaging 1,175 fps, but that still is rather anemic compared to what the .38 Super is capable of. Winchester loads were a little stouter, providing the equivalent of 9mm +P performance, and the CorBon loads were better still. Between the checkering and the 34-ounce weight of the all-steel gun, the recoil of even the CorBon 125-grainers was not bad at all. Felt recoil and muzzle rise was less than a Government Model in .45 ACP with most loads. Full mag dumps were fun, which is not something I can say of a lot of the guns designed for concealed carry I've been reviewing lately. Is the Stinger a pocket gun? No, you'll need a holster, but any holster designed for a 1911 with a 4.25-inch barrel will fit the Stinger. Good holsters do a better job of concealment than cheap ones, so don't pony up big bucks for a pistol and then buy a $20 nylon piece of junk that lets the gun flop all around. And make sure you have a good belt, because a holster that doesn't stay in place isn't doing you any good. Currently I am running a Blackhawk! CQC pistol belt, which not only has a reinforced spine and looks sharp but retails for just $30. 1911 magazines designed for the 9mm and .38 Super have ribs running up the sides. While not as common as .45 ACP magazines, you won't have any problem finding sources. The stainless steel magazines supplied with the Stinger comfortably hold eight rounds, and full-length magazines designed for a Government Model-length pistol will hold 10 rounds. One of my continuing complaints is how most guns are not sold with the proper number of magazines—as in more than one. The Stinger is supplied with not one, not two, but three magazines, for which I commend Les Baer. All have black plastic J&J base pads, which can be removed and reinstalled using a high-tech tool called a Phillips screwdriver. 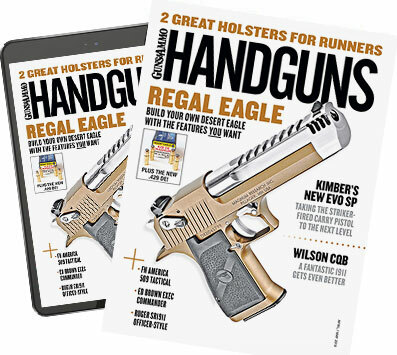 When I carried a 1911 I would remove the base pad from the magazine I had in the gun to reduce printing and leave the pads on the other magazines to ensure proper seating during reloads. What do you get with the Stinger in .38 Super? An extremely accurate and concealable custom 1911 that doesn't sacrifice capacity or power, supplied with night sights and three magazines, all for much less than many custom 1911s out there. What's not to like? The Stinger is big enough to give you a good sighting length and get your whole hand on the gun, but is smaller and lighter than a Government Model.